The short programs will kick off Skate Canada today, with all four disciplines competing. Men’s short program – 4:15 p.m.
Stephen Carriere – 4:40 p.m.
Adam Rippon – 4:53 p.m.
Max Aaron – 5:20 p.m.
Pairs short program – 6:10 p.m.
Madeline Aaron and Max Settlage – 6:30 p.m.
Short dance – 8:45 p.m.
Alexandra Aldridge and Daniel Eaton – 9:11 p.m.
Madison Hubbell and Zach Donohue – 9:24 p.m.
Ladies short program – 10:15 p.m.
Courtney Hicks – 11:15 p.m.
Ashley Wagner – 11:41 p.m.
Ashley Wagner, a 2014 Olympic bronze medalist in the team event, will compete at Skate Canada for the third time in her career. She most recently won bronze in 2011. Wagner has qualified for and medaled at the last two Grand Prix Finals, winning bronze in 2013. Courtney Hicks, who opened her season with a second-place finish at the 2014 U.S. International Classic, will compete at Skate Canada for the second time in as many years. She placed sixth in 2013. Max Aaron is the 2014 U.S. bronze medalist. He most recently won the U.S. International Classic in September for the third consecutive year. Adam Rippon opened his season with a silver medal finish at 2014 Finlandia Trophy. The longtime Grand Prix competitor will take Skate Canada ice for the third time in his career and first since 2011. Stephen Carriere was added to the Skate Canada lineup last week. He already owns a Nepela Trophy gold medal from this fall. 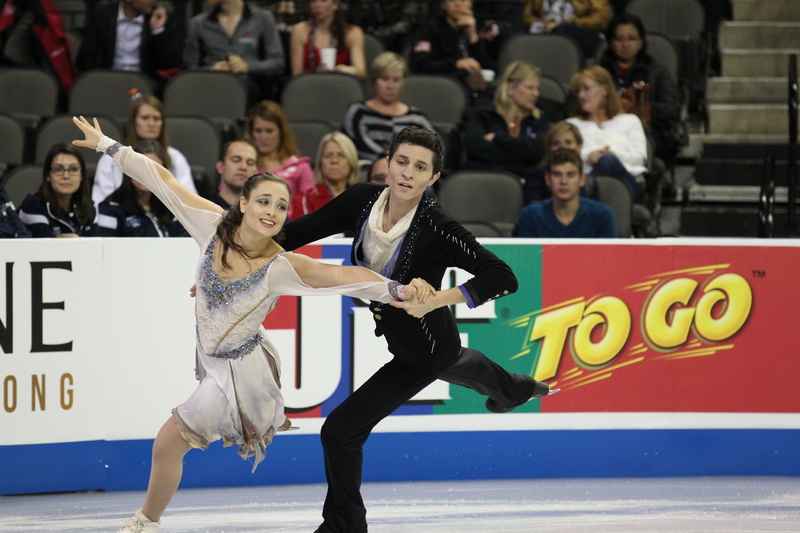 Madeline Aaron and Max Settlage, the 2014 U.S. junior champions, made their Grand Prix debut last week at Skate America and finished fifth. Friday, Oct. 31 Men’s short (LIVE) 4:15 p.m.
Pairs short (LIVE) 6:10 p.m.
Short dance (LIVE) 8:45 p.m.
Ladies short (LIVE) 10:15 p.m.
Saturday, Nov. 1 Men’s free (LIVE) 1:55 p.m.
Pairs free (LIVE) 4:25 p.m.
Free dance (LIVE) 8:05 p.m.
Ladies free (LIVE) 10 p.m. The ISU Grand Prix of Figure Skating Series continues this week with Skate Canada, Oct. 31-Nov. 2, at Prospera Place in Kelowna, British Columbia. NBC will air competition coverage from 1-2:30 p.m. (ET) Sunday, Nov. 2. In addition, Universal Sports will air additional coverage throughout the weekend. Icenetwork Season Pass subscribers will have access to live video from both days of competition, in addition to photos and recaps, available to all users. Tweet @USFigureSkating and use the hashtag #SCI14 to join the conversation on social media. Here’s a sneak peek of the cover for the November issue of SKATING magazine. After Chris Knierim’s squad scored over 50 points in Thursday’s game, it looked like Snowplow Sam’s team would drop another game and move to 1-7, but Ben Rothlisberger disagreed. Snowplow Sam’s quarterback scored a season-high 44 points, Golden Tate scored 21 and the Bills defense scored 16 in route to a 123-123 tie. Knierim remains a game behind Ashley Wagner who won this week after a tie of her own (with Max Aaron) last week. Charlie White’s team got its third win of the season as it topped Ryan Bradley’s squad in a blowout. Bradley, who had good performances from Peyton Manning, Stephen Gostkowski and Le’Veon Bell, was hurt by negative points by his defense. On the flip side, White’s team had a strong week. Matthew Stafford scored 19 points in the Lions’ comeback win over the Falcons and Mark Ingram and Larry Fitzgerald each scored 23 and 22 points, respectively. Ross Miner had a huge win over Ricky Dornbush, both in standing and in score. Both teams were 4-3 entering the week and this weekend’s matchup could prove to be big as we move towards the playoffs. This result was never in question as Miner won by nearly 60 points. Tom Brady’s 34 points led the way, but he also was helped by strong performances from DeMarco Murray and Randall Cobb. No player on Dornbush’s team scored over seven points with two players (Trent Richardson and Isaiah Crowell) scoring zero. Max Aaron’s team, which had gained significant momentum after tying Ashley Wagner’s undefeated team, lost a tough one to Evan Bates. Bates, who took home gold in ice dance at 2014 Hilton HHonors Skate America with partner Madison Chock over the weekend, trailed until Sunday night when Aaron Rodgers and Eddie Lacy combined for 41 points. Bates, who started the season slow, now has his team riding a two-game winning streak. Ashley Wagner got her team back into the win column with a huge win over John Coughlin’s team. Coughlin’s 99 points were respectable and, in fact, would have beaten three other teams this week, but Wagner’s squad was on fire. Wagner, who would’ve beaten every other team in the league by a minimum of 23 points, had four players score 24+ points, including Arian Foster who notched 35. Coughlin, too, was a little distracted as he was making his icenetwork debut and nervously rooting on his Kansas City Royals in the World Series. Another successful Skate America is in the books! The Sears Centre Arena in Hoffman Estates, Illinois, was an excellent host, and we’re excited to have kicked off the 2014 ISU Grand Prix season. Look back at the conversation on social media here, and participate by using the hashtag #SA2014 or mentioning U.S. Figure Skating. Competing at the 2014 Hilton HHonors Skate America in Hoffman Estates, Ill. is a special treat for Chicago-area native Alexa Scimeca and her partner both on and off the ice, Chris Knierim. It’s not often skaters get to compete at home. When the opportunity presents itself, it connects the skaters and audience in a deep way. As evident by the rousing cheers the duo received when they took to the ice Saturday to perform their short program, they have quite the support group in Chicago. Scimeca’s parents, as well as her brother, sister, aunt, nana, papa, cousins, and multiple skating friends filled the Sears Centre to cheer on the couple. While competing has kept them busy much of the time, Scimeca and Knierim will spend an extra day in Chicago, catching up with family. Scimeca has already visited her home and spent time with her parents and the family’s beloved cats. Scimeca began her career as a singles skater in Chicago and had her first pairs lessons at a rink not far from the Sears Centre. Scimeca trained in Addison for 10 years, before taking up pairs. “I needed some fresh new experiences and decided to look into pairs. Jeremy Allen gave me some lessons in Illinois,” Scimeca said. Since then Scimeca has never looked back and her pairs career is taking off. In addition to Skate America, Scimeca and Knierim are slated to compete at another ISU Grand Prix event, Trophee Bompard, in November. Scimeca and Knierim’s goal is to improve with each competition. “We still have some technical errors we need to work out, but our other mark is growing which is something really nice to see,” Knierim said. Part of that growing score might be attributed to a mature short program music choice, El Tango de Roxanne. The routine pushed Scimeca and Knierim out of their comfort zone, but the style suits them perfectly. “We definitely chose it (the music) because it’s nothing like anything we’ve done before. We typically pick something slower and softer. We wanted to spice it and do something different,” Scimeca said. Fans of their typically soft and elegant style will be in for a treat during today’s free skate, where they will skate to An American in Paris, by George Gershwin. When Anastasia Cannuscio and Colin McManus took the ice for their free dance at Skate America on Saturday, they sported a Level 4 make-up job. The University of Delaware of skaters aren’t playing zombies or vampires in their Danse Macabre program. They’re just dead. So, how to play dead, without looking too ghoulish? Cannuscio and McManus began their quest at Champs Camp in August, where celebrity make-up artist Robin Black delivered tips on looking ghostly, including dark contouring and smoky eyes. The make-up maestro may have done her job too well. Feedback from judges and officials at the U.S. International Figure Skating Classic, where Cannuscio and McManus won bronze in September, said it looked a bit too realistic. “We heard things like, ‘You really do look like you just climbed up out of your grave,’” McManus said. Next, the duo turned to artists from University of Delaware’s theater department, as well as Delaware’s First State Ballet. “When people tell me I look a little pale and tired, I just say, ‘Thank you,’” Cannuscio added. Of course, makeup isn’t uppermost in the team’s concerns. Partners since 2008, they placed seventh in the U.S. last season after two consecutive sixth-place finishes. Seeking some fresh input, they traveled from Delaware and coaches Karen Ludington and Sasha Kirsanov to Quebec for a month this summer, to train under two-time Canadian World silver medalists Marie-France Dubreuil and Patrice Lauzon. Both Cannuscio and McManus were a bit star-struck at first. The married Dubreuil and Lauzon, who won two World silver medals, were noted for their romantic on-ice chemistry and high performance quality throughout their careers. Cannuscio and McManus absorbed as much of that as possible. “Marie really taught me how to grab my skirt, work it and stamp my feet in the paso doble,” Cannuscio said.